Which MicroPerformance+ Saddle Pad best suits my needs? Depending on which riding discipline horse and rider take part in, the shape of your horse’s saddle will usually be designed to accommodate the style and riding position of your preferred activity. If Dressage is your favoured way to compete, then the MicroPerformace+ Dressage Saddle Cloth has been ergonomically designed to best suit the needs of you and your horse. Dressage riders sit very straight and upright on the saddle orchestrating the horse’s dance movements without moving much themselves. As the result, the riders’ centre of gravity tends to be central and high and the front of the saddle is straight cut. This means that the saddlecloth also needs to straight cut in front in order to accommodate the saddle, best suit the activity, and provide better comfort for the horse while enhancing the position of the rider. In contrast, when engaging in jumping – whether it is show-jumping or cross-country course – to accommodate the more forward movement and jumping motion of the horse the centre of gravity becomes lower and more forward as well. Therefore, both the saddle and pad need to sit further forward and have a curved front. Jumping pads also need to be cut shorter at the bottom to allow more contact between the horse and the riders’ lower leg – which is essential when negotiating various obstacles. This is why MicroPerformance+ have designed a Competition Saddle Pad encompassing all of the above design features. When choosing your saddlepad, some physiology of the horse should also be considered. In addition to the horse’s size which should always be taken into account, some horses are born with high withers. In this case the horse should wear a pad specifically designed for their shape as well as size. Using a normal pad on a high withered horse would not provide the required clearance, meaning pressure could build on the horse’s wither – resulting in discomfort and potential injury. MicroPerformance+ have therefore designed a General Purpose Pad specifically engineered for this type of anatomy, granting your unique equine ally the comfort and protection they deserve. In addition to the anatomy and sport-specific saddle pads on offer, MicroPerformance+ have also designed an excellent ‘All Purpose/General Purpose’ (AP/GP) pad, mainly used for everyday exercise and hacking. 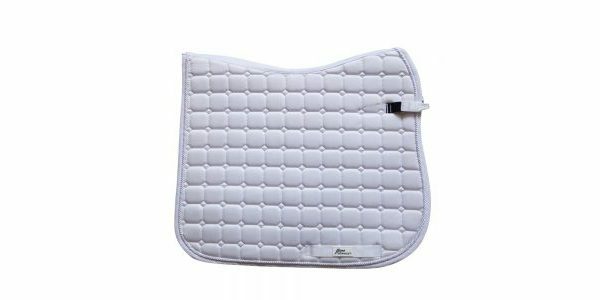 This pad adopts features from both the Dressage and the Jumping pad making it a great all-rounder. Whatever your preferred way of spending time with your horse, you can guarantee that MicroPerformance+ has the equipment you need to make certain both horse and riders’ needs are taken care of, giving you the very best chance of success at competition and ensuring that every ride is an enjoyable event for all. Why use a MicroPerfomance+ Saddlecloth or Numnah?